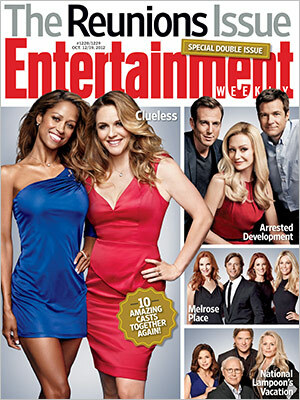 Entertainment Weekly Reunion Issue…Not Exactly What It Sounds Like. In My Humble Opinion: If a magazine is going to have a “reunion” issue, then make sure you can get the entire cast from the movie or television show that you’re advertising as a reunion. I can understand that Randy Quaid couldn’t make it for the National Lampoon Vacation reunion, after all he is technically a wanted fugitive here in the United States….he’s hiding out in Canada. But I went on to read about E.T. and the only three people participating in the reunion were Steven Spielberg, Drew Barrymore, and Henry Thomas. What about Peter Coyote, Dee Wallace, Robert MacNaughton (Elliot’s older brother), Erika Elaniak? Hell even C. Thomas Howell…after all he was the coolest kid on a bike with his ski mask, you know you thought the same thing when you were younger. Did Entertainment Weekly reach out to these people at all? I can’t imagine that the three people featured were the only ones that wanted to participate in a story about one of the most profitable and successful films in history. Another movie that was touted as having a “reunion” was Some Kind of Wonderful. This film is probably one of the least well-known films by John Hughes, but is still a pretty good movie. For the reunion Eric Stoltz and Mary Stuart Masterson were the only two people featured…really? What about Lea Thompson, Craig Shaffer, Elias Koteas, and John Ashton…they had pretty substantial roles in the movie as well. Lea Thompson was the main love interest of Eric Stoltz’s character for Pete’s sake. I mean I love Entertainment Weekly, read it all the time, but seriously, if you’re going to have a reunion issue, get everyone involved…I was half expecting to read a story on The Goonies with only Sean Astin and Josh Brolin featured.